Combat training and BIS gear for many activities, what are you waiting for? Set any spell to autocast before the script starts, this lets the script know you want to cast spells. The script will automatically autocast the highest level spell you can cast after each reset. Here is my 2nd two hour proggy, first one was about 10 points less across the two hours. Good script so far 2.5 hours 304 points veteran. Flawless. Been using this script for a little more than 10 mintues now. Seems to be a nice bot, however I'd love to see a cursor! UPDATE: This script makes quite alot of points per hour on immediate whilest i'm level 75. 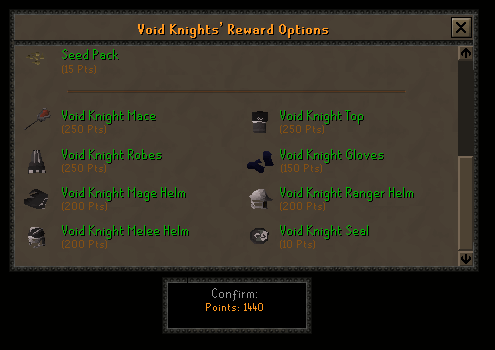 UPDATE2: Didn't took too long to get full void with all helms. Q: How do I select the boat I want to enter/ How do I select difficulty? 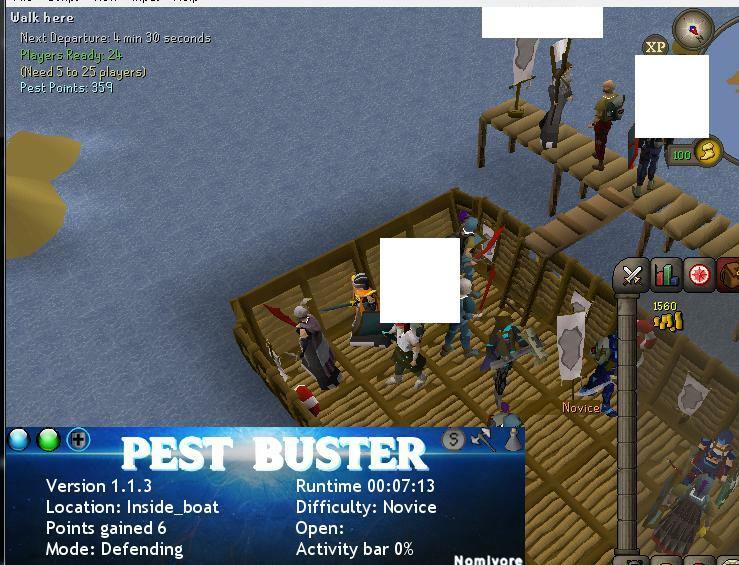 A: Stand outside the boat you want to enter. Running it now! It works, but it doesnt seem to legit enough. It's way to obvious for people to see that you are botting. 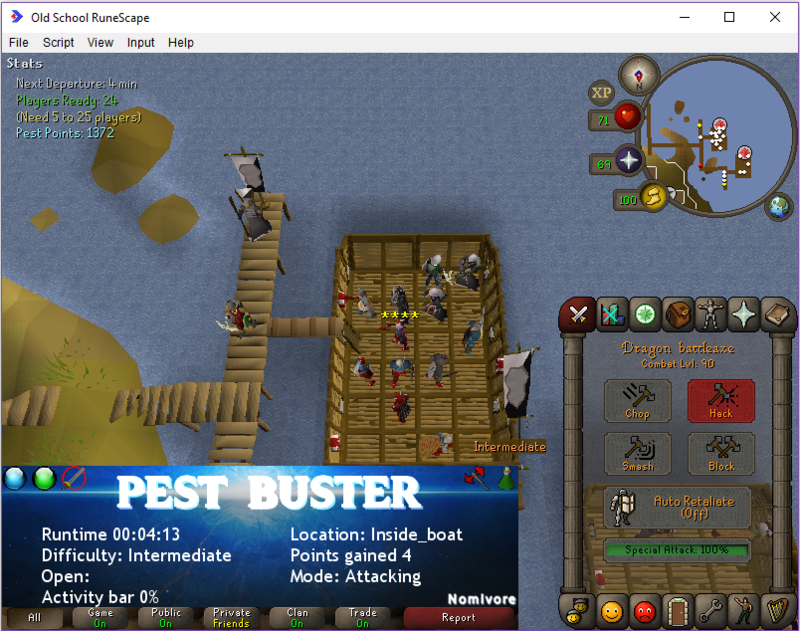 Glad there's a working Pest Control script now, and thanks for the feedback! I initially made the enable/disable system because my dude kept dying to Splatters, but you're right, a priority system makes more sense. For the spinners/portals case, at least in high levels, I found people just outdamaged the spinner's heal. Perhaps I'll check how many spinners are around and change focus, but for now it should work in most games. What boat are you running? I imagine intermediate with weak players has it worst. and sometimes u are just 3-4 at one portal and with intermediate u dont outdamage the spinners, for that u need around 5-6 people i suppose! edit: option to switch prayer on or off would be helpfull! now i'm the only one with prayer and people notice it quicker! In all my experience, no one uses protect prayers for any extended duration. Just limit yourself to non-visible prayers. 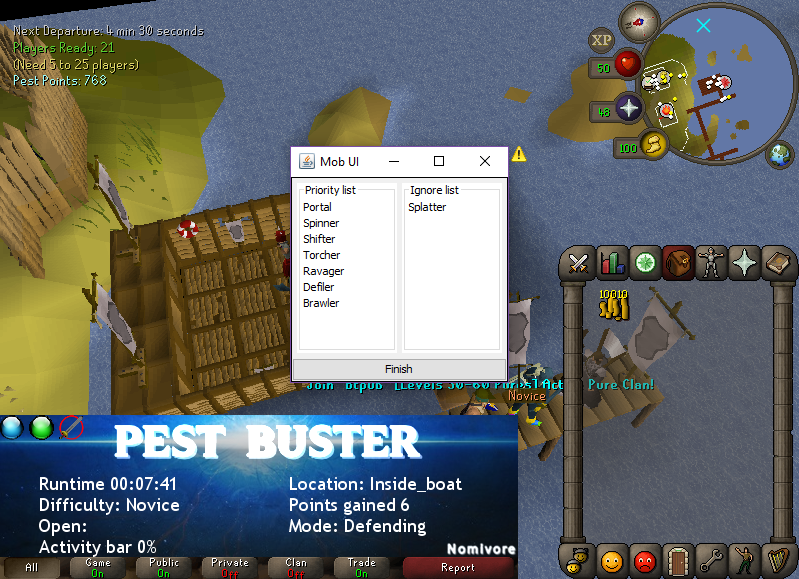 On the other hand, there's probably some pure that doesn't level prayer at all, so I'll add an option to disable. Thanks. Using now in veteran boat, got me through the first game but very close to losing activity bar. 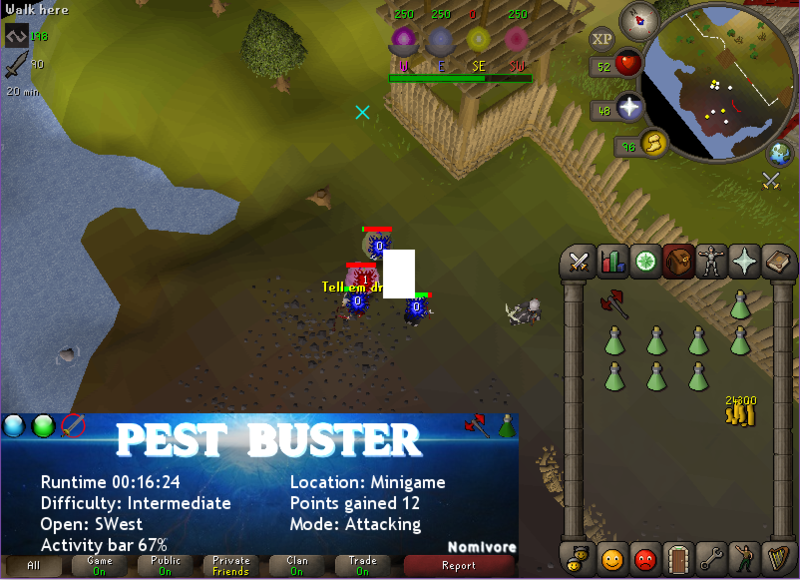 Gonna try defender role next. For attacker on veteran, the click speed is just too slow. Higher levs kills the monsters so fast that they are dead by the time the bot chooses to attack. EDIT: Defender is easier to keep activity bar up, but the bot opens gates to get to monsters on defender and thats a good way to lose a close game if the knight is taking a lot of damage. Double click to send item to the other list. Click/drag supported for items within the priority list for reordering. Will be added after a bit more testing. Dragon battleaxe and potion drinking added. For dragon battleaxe, have your main and offhand equipped before starting the script so the script knows what to re-equip. For potions, it will drink once at minigame start, don't have any potions you don't want to use in your inventory. Pretty good script, but only reliable method for getting points i've found is on defence with only shifters selected, as it likes to run off and get stuck trying to attack others over walls and such. On attack sometimes has trouble attacking mobs and will hover over shielded portals. Sorry, had a compile error since I forgot to commit a file. I changed the way it detects closed portals so it shouldn't do any of that hovering anymore. It's been working well for me the whole of today. Really sorry, apparently something I was testing out was causing all my scripts to break and it didn't give any errors at all. Confirmed that the script is up, currently using the public version now. Glad you can notice the improvement! Never had the bug where it clicks other boats. It should always be targeting the nearest gangplank when it leaves the minigame. If you can try to describe exactly what it does that'd be nice. Ive only seen it actively do it once but it seems to happen every hour or two, will click minimap after leaving game towards the other boat, in my case i was using intermediate and it was trying to go to max boat, then gets stuck targetign nearest gangplank. If it walked directly to the gangplank, then it's an error with the client since it didn't properly find and sort the objects. If it walked into the distance, no idea since I should have fixed that bug already. Minimised mode now shows a basic paint. If you enjoy the script, please post a progress pic! Runs back and forth a lot. Or just stands at Knight in Defender mode. I only have Shifters set but doesn't tend to do much. Likes to run to the boat to leave during game then run back to middle. Script used to run back to knight when it was far away regardless if there was a mob nearby, now it attacks the nearby mob. Inner area bound was off by 1 tile, meaning it'd try to attack mobs just outside the gate. Not sure about leaving in the middle of the game, that's never happened to me. Bot seems to be MUCH QUICKER in clicking the boarding ramp, that was the biggest error I had with it previously, makes a huge difference in pts/hr. If I get a good proggy will send.